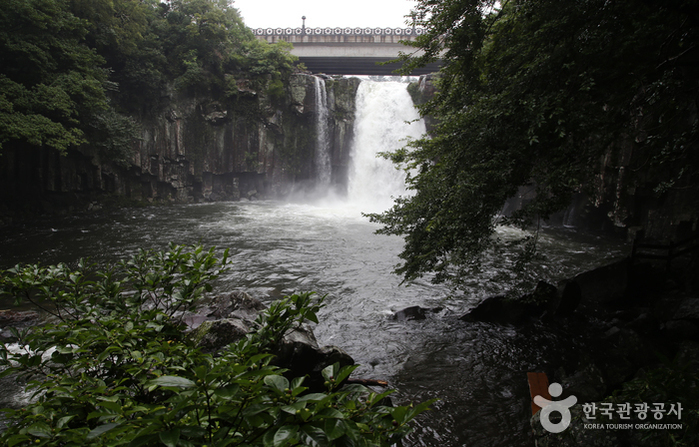 Cheonjeyeon Falls, named “The Pond of God,” consists of 3 sections. Around the falls, a variety of plant life thrives, such as the rare ‘solimnan’ reeds. To the east, there is a cave where cold water pours from the ceiling to create the first waterfall. The water gathers into a pool and from there, falls two more times, creating the second and third waterfalls, which then flow into the sea. In Cheonjeyeon Valley, visitors can see Seonimgyo Bridge (arch bridge with 7 nymphs carved on the side) and the octagonal Cheonjeru Pavilion. Seonimgyo Bridge is also called Chilseonyeogyo, meaning “seven nymphs bridge,” and it connects Cheonjeyeon Falls with Jungmum Tourist Complex.